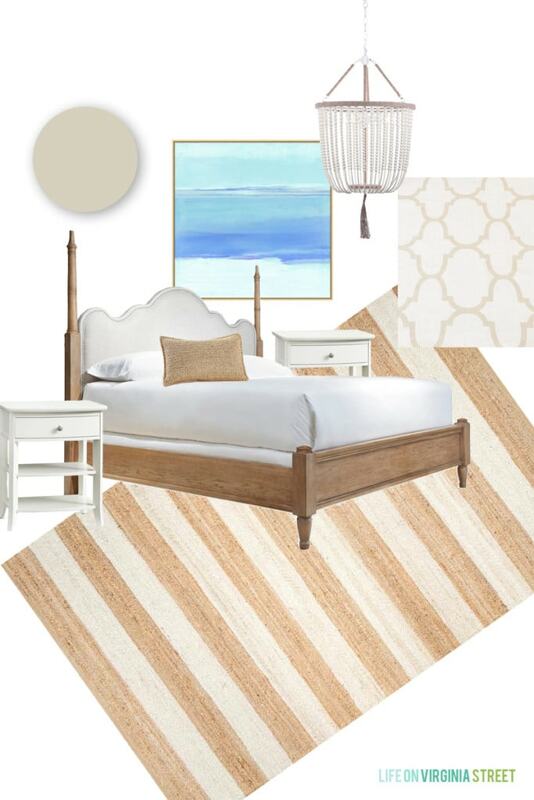 Remember way back in March when I shared my beachy guest bedroom refresh plans? It’s definitely okay if you don’t because it’s almost been half a year! The crazy part is, the room has been completed for most of the summer but with all the visitors we’ve had, along with the kitchen renovation, I just never took the time to photograph the updates. 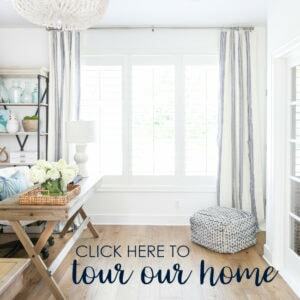 I had shared some progress photos in our spring home tour. 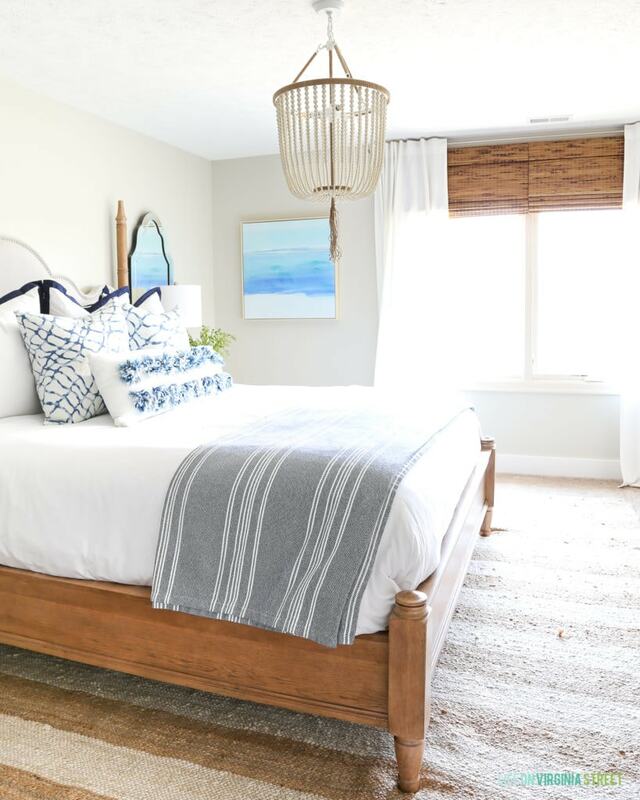 But now that summer’s coming closer to an end, I figured I had better share our beachy guest bedroom reveal before I change things over in a few months for fall! And I’m not even sure I should calling this a “reveal”, given that I’ve shown most of the updates, but it definitely looks a lot different now! Before we get to the reveal, here’s a reminder of the design board I initially put together. I ended up changing out a few elements, but for the most part, I followed it closely. I won’t go into all the updates we’ve made in this room since we moved in nearly 6 years ago, but I thought it would be fun to share how it looked shortly after we moved in! And here’s how the space looks now from the same angle! 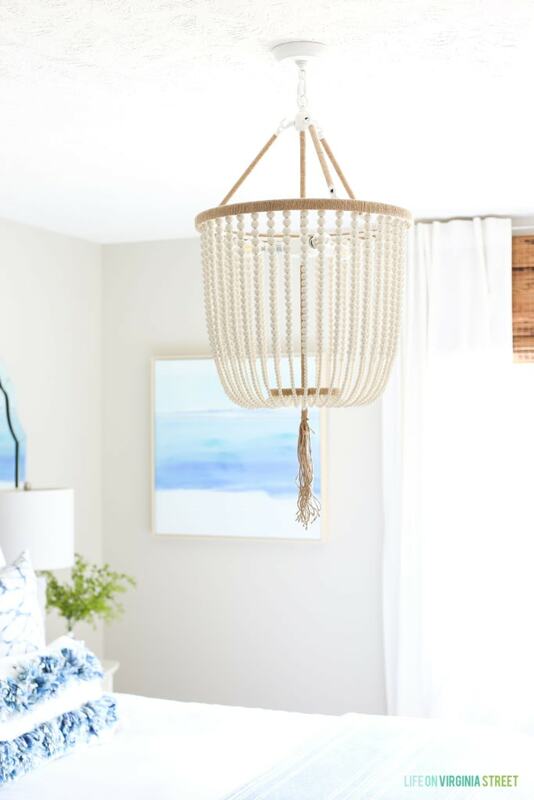 The biggest change since I last showed the space is the addition of this beaded chandelier. 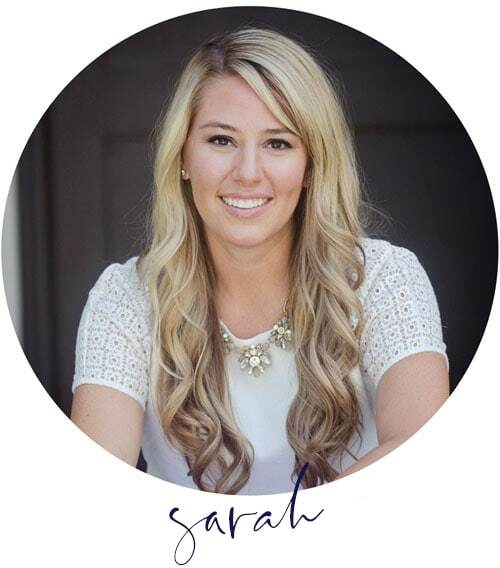 I searched for months to find the perfect option that would fit in the space, but also wasn’t too expensive. We have standard 8′ ceilings on our second level, and most lights were just too big. This one was the perfect option (and this one was a close second)! I’m thinking I may still trim the tassel at some point (maybe half-way?) but otherwise, it’s perfect! It definitely adds to the beachy, boho vibe I was going for. You’ve seen these nightstands I added earlier in the year. I made a small change and added these pulls to the drawers for a bit of personality. I love that they mimic the look of seaglass. In the reflection, you can see the rattan mirror I have hanging on the opposite wall. I forgot to get a standalone picture of it! I picked up this lumbar pillow at HomeGoods the other day. 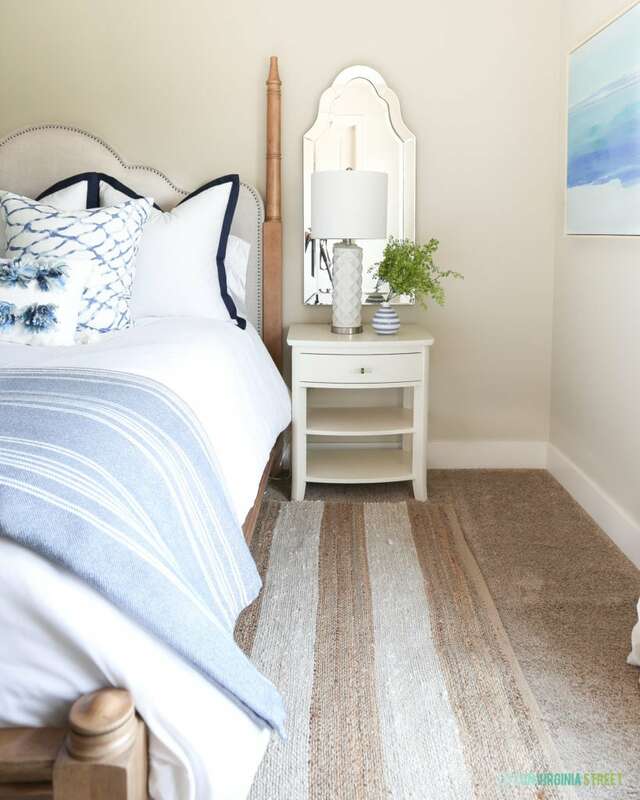 It has the perfect colors, and I love the boho vibe it adds to the room. Very Anthropologie-ish without the price tag! They had a bunch in stock (in different colors too) so hurry in if you also love it. I’m reusing these water print pillows that I used in our living room a year or two ago and love them in here for summer! I also bought the art early in the year during a 20% off sale and finally got it hung a month or so ago. I love the saturated colors and the serene feeling it adds to the room. The striped rug is holding up well after nearly six months, but I may need to slightly move it around under the furniture again, as it seems to be slightly shifting in areas. And the striped blanket at the end of the bed from Target is so perfect, we also bought the linen color for another room! The paint color in the room is Dutch Boy Existence. 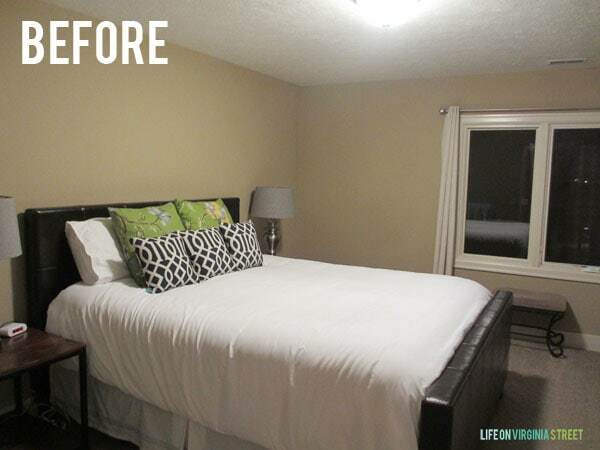 You can see that makeover and how I painted over the striped walls here. I’ve included all other room sources below. I hope you enjoyed this quick little makeover! It’s been fun hosting guests in this updated space the past few months! Where did you get the duvet cover from? Is it a linen blend or cotton? 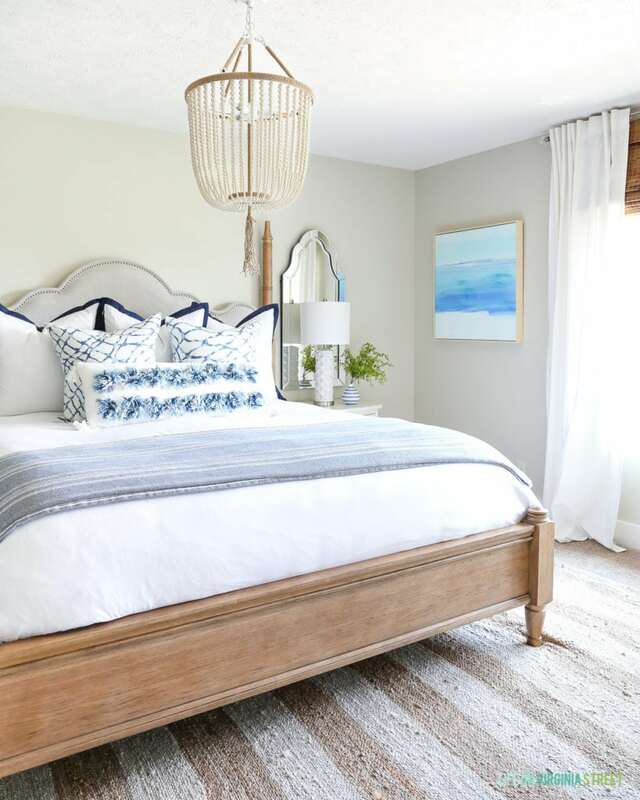 Love the look…I have the target blanket too..,and it’s totally warmed up my bedroom as an accent at the foot of the bed! Thanks for Shari g your beautiful home! I got it from Hayneedle several years ago. It’s a polyester/microfiber blend. It has a bit of a “shiny” appearance to it but it’s held up well and is really soft! Here’s the link if you’re interested: https://rstyle.me/n/biwf6z75re. Any guest would love this beautiful space! The chandelier is my favorite! 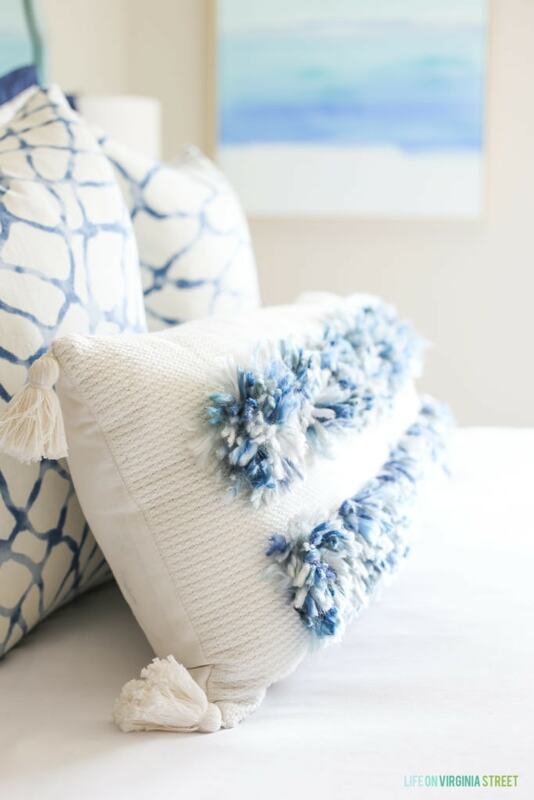 Where is the adorable Pom Pom fringe pillow from, please? Any chance you know the brand of this pillow. I went searching at home goods but couldn’t find it and absolutely love it! 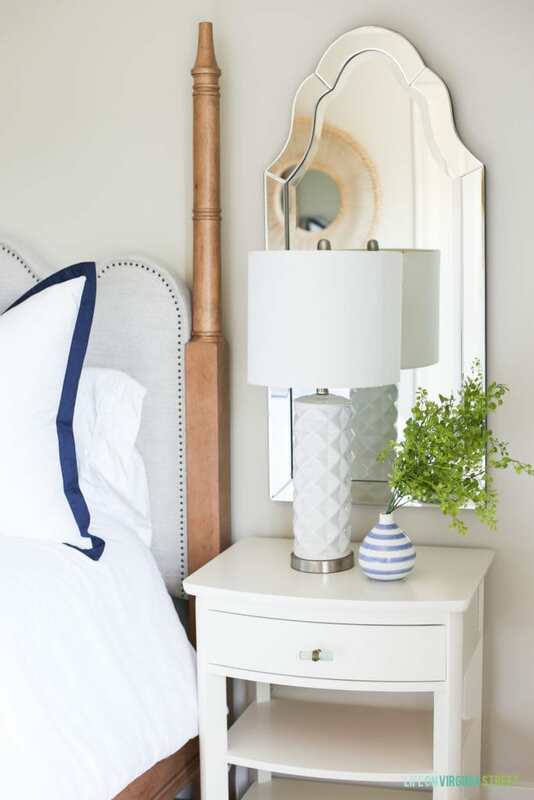 Where did you get the pretty white bedside lamps? What kind of wood blind and curtains did you use?